Many people who are new to the world of home aquariums, initially imagine a fish tank filled with goldfish or chiclids. This may work well for a freshwater aquarium, but if you are interested in starting a saltwater aquarium, selecting good starter fish may be a bit more challenging. If you are reluctant about starting a saltwater aquarium because of the additional maintenance it may require, the Connecticut custom aquarium installation specialists at Normal Aquatics of Fairfield, Connecticut are here to assist you in selecting tropical saltwater fish that have proven to be hardy, undemanding, and well-suited for the beginning hobbyist. In continuing with our blog post from last month regarding the Best Saltwater Fish for a beginner aquarium hobbyist, we have listed additional fish below that will be best suited for you as you begin your exciting journey into owning a saltwater aquarium. Blue Spotted Rabbitfish: The Blue Spotted Rabbitfish, will typically swim in duo and enjoys a spacious tank that contains reefs. It can exist among more aggressive fish because it uses its dorsal fins, which act as a defense mechanism once it feels threatened. They will make an excellent addition to your fish tank because they have a very appealing appearance, they are not combative with other fish, and they require overall low maintenance in order to survive. Chalk Bass: The Chalk Bass is an attractive fish that typically possesses a color of orange combined with a purple mid-area and electric blue stripes. It is considered to be an overall peaceful fish and non-territorial, so it will mix well with any other fish of the same nature. If you possess a reef in your aquarium, you will not have to worry about the Chalk Bass causing any damage to it, and that will go for the majority of invertebrates as well. They are considered very hardy fish and are easy to feed. 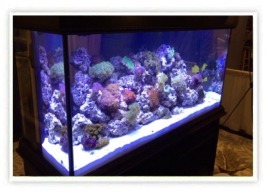 They are also accustomed to inhabiting many different sizes of tanks and reef environments. Clown Goby: The Clown Goby is a non-confrontational fish which will make an excellent addition to a reef fish tank, which inhabits colonies of hard and soft corals. The majority of Clown Gobys are carnivores and since they remain relativity small and their diet consists of a variety of shrimp. They are not aggressive hunters and will usually wait until the appropriate opportunity to feed. They will seldom get in confrontations with other fish, however if you have small and congested tank, they have been known to fight with fish of similar size and stature. Establishing a marine reef aquarium may seem like a daunting task, however it can be a very exciting and easily attainable undertaking if you have good information and a few tips to help you along the way. If you have any questions regarding your fresh or saltwater aquarium setup or maintenance, you can contact the aquarium specialists at Normal Aquatics for a free consultation by calling (203) 292-5922. Normal Aquatics of Fairfield, Connecticut provides custom aquarium installations, aquarium maintenance and repair, and custom pond installations. Our service area includes the following towns and surrounding areas Stamford Connecticut, Greenwich Connecticut, Long Island, Westchester County New York, White Plains New York, New York City, Northern New Jersey, and all of New England. Contact us today for a FREE Consultation!